Age-specific words and examples are very important when covering the topic of violence with kids. The AAP doesn’t recommend broaching subjects of violence before the age of 8 unless we really have to. A few months ago one of my kids woke up and ran into the bedroom before I had a chance to switch the TV off and saw an image of a police dog in a pool of blood. She didn’t actually say anything right then, but 4 days later started talking about a dead dog full of blood. My first reaction was to deny she had seen it, but I realized that wasn’t going to help - so I told her that the dog had been hurt in an accident and that a kind gentleman had helped the dog and made sure he got to the hospital, where he had an operation and survived (which was actually the truth). She never mentioned the story again. 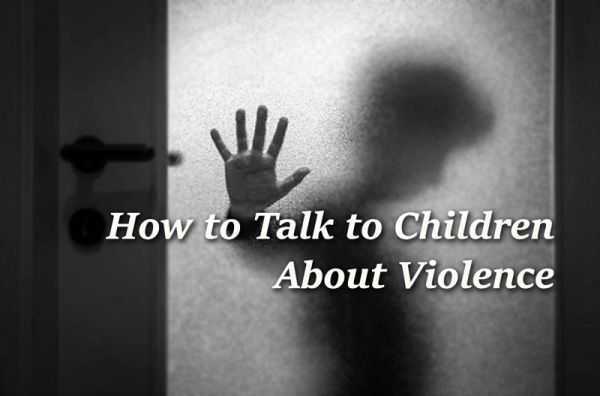 So while it’s best to wait until kids are at least 8 to talk about violence, we can’t always avoid it. So, for kids under 8 it’s best to keep the story simple and truthful. When it comes to mass shootings I would most likely say “a bad person hurt a lot of people and we are now trying to make changes so this doesn’t happen again”. We also really need to make sure we have our own emotional reactions to news first, away from the kids, if possible. When it comes to elementary school-aged kids the talk may get a little tougher, especially when they start asking questions, or if they have access to violent images. At this point it’s best to explain the situation in simple terms without digging too deep into the details. We can also help them understand the importance of helping others by showing that there are many good people in the world, and these outnumber the bad (first responders, brave teachers, students etc.). A positive spin can help remove a lot of the darkness that surrounds something like a mass shooting. Tweens are going to hear about a mass shooting and talk about it with their friends whether we like it or not. So at this point you can start the conversation first. Open the circle of trust and ask them what they have heard and what they feel. By giving them an open platform to express themselves and ask questions you can guide them through their fears and concerns, and show them ways they can help others talk through the situation too. This circle of trust will also give kids the confidence to confide things that they may be worried about (a friend who seems withdrawn, bullying etc.). Teens are very much aware of what is going on around them and at the same time probably the most affected by these types of events. This means that it’s important to not only ask and talk about how they feel, but also talk to them about what they would like to see happen next. Can we help them? Would they like to do something to push for change? Can we help them move forward? There are many options for teens to delve into activism, including joining in with their peers in the #MarchForOurLives and #NeverAgain movements. It’s very important not to downplay a teen’s need to become active, in the end they will be the leaders of tomorrow, so why not start now? We need to remember that our kids are going to look to us for reassurance, comprehension or an explanation, and an outlet for their feelings. This is why it is so important that we try to gather our emotions and thoughts together before we react. In my opinion we shouldn’t stop ourselves from crying, expressing anger, or hurt, these are natural emotions, but we should frame it in a way that our kids always feel like they can come to us for reassurance. We are never going to be able to completely shield our kids from traumatic events: it is important that they understand that there is good and bad, and a lot of grey in between. However, we can help them process these events in as healthy a way as possible, and stand by them when they stand up and raise their voices. We only have to look at the teens who are organizing marches and actions all over the country today: these kids are the face of the future, and a very bright and hopeful face they make too! I found this article very helpful in deciding how to broach the topic of traumatic and violent events with my children and my younger cousins. I would love to hear tips from other parents too, as this is something that we all have to deal with nowadays.